Recipe from Chef Michael Allemeier for the Dairy Farmers of Canada. 1Scrub potatoes and dice into 3/4-inch pieces. Cook in large pot of salted water until tender. Drain well; let cool slightly. Meanwhile, in a large bowl, mash eggs with a fork. Whisk in mayonnaise, whipping cream, sour cream, mustard, lemon juice, onions and mint, until creamy. Add warm potatoes to dressing; season to taste with salt. Cover and refrigerate until serving. 2To serve, in a medium bowl, toss berries, arugula and balsamic vinegar; reserve some of the berries and arugula. 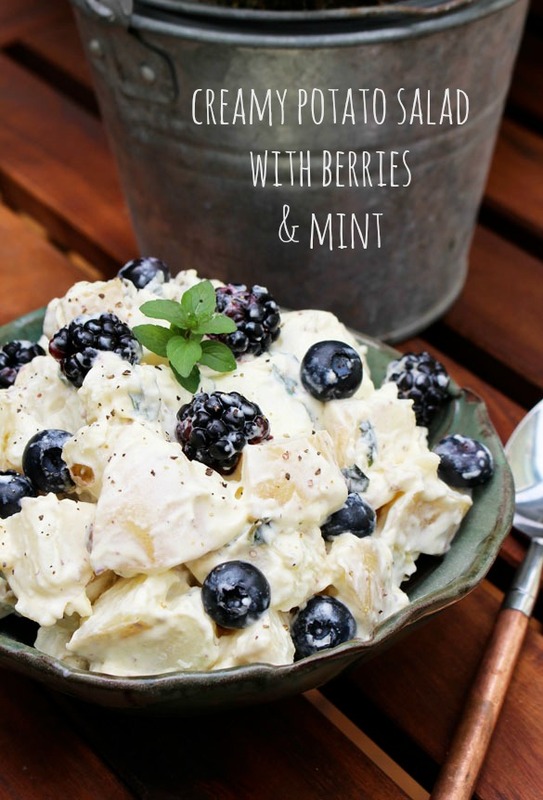 Fold berry mixture into potato salad. Serve in a bowl or on a platter; garnish with reserved berries and arugula.